I’ve been on an orange and pistachio kick lately – two of my favorite flavors. I firmly believe the old adage that we eat with our eyes first so I always pay special attention to presentation. I don’t like to serve anything that isn’t appealing to the eye. 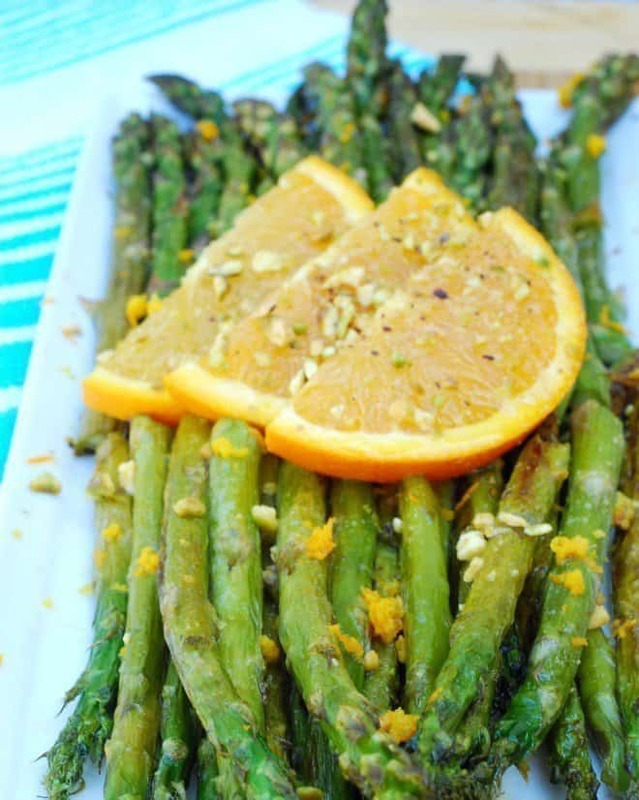 Asparagus is a beautiful spring vegetable and one of the easiest side dishes to prepare. 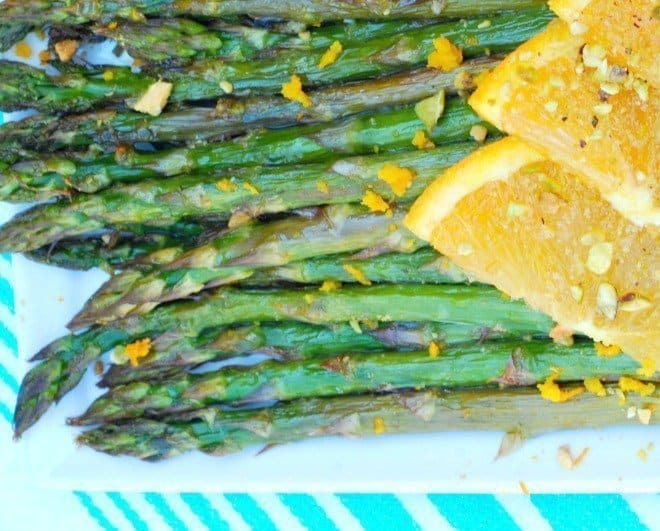 Pistachio Orange Asparagus takes my favorite roasted veggie to a whole new level. The orange juice and grated peel adds a refreshing citrus note and the intense flavor of the toasted pistachios combines wonderfully with the tangy citrus flavor of the orange. When prepping asparagus, always snap off the woody ends and discard. If you’re in doubt of how far up the stalk to go, bend the asparagus spear and it always breaks at the correct place. To save time, I grab a few spears at a time, stems in one hand and the woody end in the other and just snap away. It doesn’t take long at all. Did you know that Asparagus is a member of the lily family and in ancient times was known as an aphrodisiac? Wink. Wink. Besides that, it’s full of vitamins and minerals. High in anti-inflammatory nutrients, including vitamins C & E, beta-carotene, zinc, manganese,, selenium. Asparagus also contains the amino acid asparagine, as well as chromium, a trace mineral that helps insulin do its job transporting glucose. It’s also especially rich in glutathione, a detoxifying compound that can help destroy carcinogens. For this reason, asparagus may help fight or protect against certain cancers, including bone, breast, lung and colon cancers. It’s good to know that one of my favorite veggies is good for me, too! What’s your favorite spring vegetable? Place asparagus on a baking pan and drizzle with a little olive oil. Sprinkle with pepper and toss to coat. Roast for 20-25 minutes or until tender, shaking the pan occasionally. Spray a small skillet with cooking spray and toast pistachios over medium heat for 3-4 minutes, being careful not to burn. Add orange juice and grated orange peel. 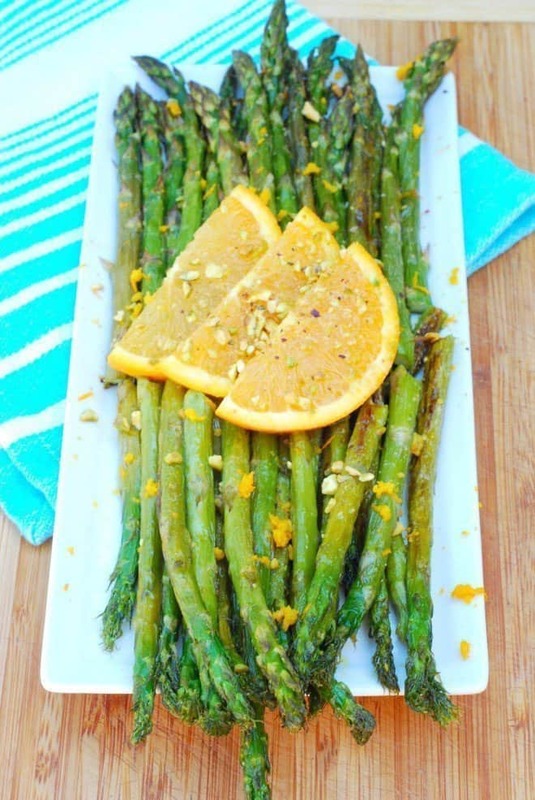 Drizzle the orange juice mixture over the roasted asparagus. Enjoy. It’s a really pretty dish, isn’t it! I know that asparagus is good for you but it’s not my favorite. I like fresh squash from the spring garden. My daughter and brother would love this recipe.